We have a choice of over a dozen carbon fibre rings in UK finger sizes J to Z+6 all in stock. 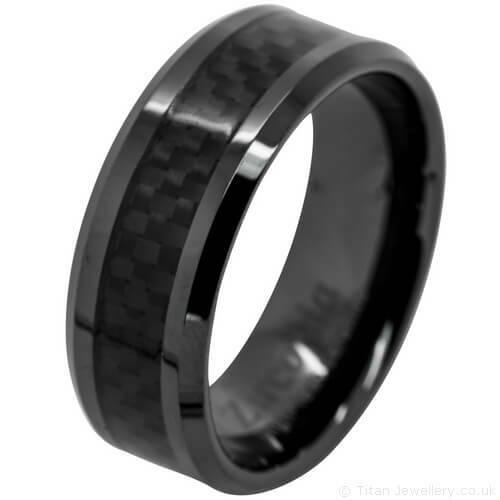 The majority of our rings are available in either the very popular black carbon fibre, or white carbon fibre inlays. And the addition of a blue and red carbon fibre in the tungsten carbide range. 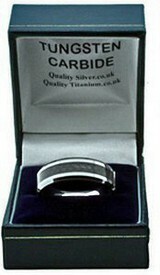 Our carbon fibre inlay rings are available in tungsten carbide, titanium, zirconia ceramic and cobalt chrome. For more information on each of the metals please view their corresponding pages. 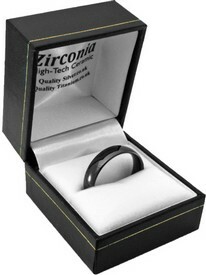 Our black carbon fibre and zirconia ceramic ring (pictured) is our best selling men's carbon fibre ring. All of our carbon fibre inlay rings will be packaged in a slim ring box when either 1st Class, or Free UK Delivery is chosen as your delivery option. The unbranded slim ring box allows us to send the carbon fibre inlay ring for a cheaper rate with Royal Mail's new priced by proportion policy. 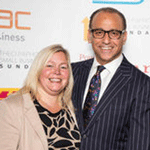 This allows us to maintain a subsidised 1st class, and free delivery service. 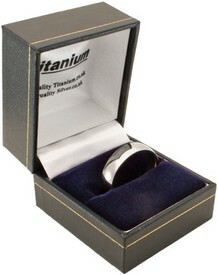 Our carbon fibre inlay rings will will arrive in a branded ring box of their main material of titanium, tungsten carbide, zirconia ceramic, or cobalt when Special Delivery, or International Delivery is chosen as your delivery option. 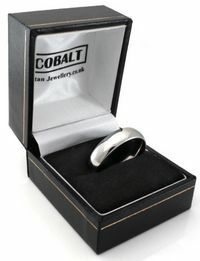 Please note that we are not able to package the carbon fibre inlay rings in the branded ring boxes if you have opted for Free Delivery or 1st Class Delivery as the ring box is wider than the 25mm limit set by Royal Mail.